Timothy Bartel reports back from the Bike Oxford cyclosportive. Now when vigorous riding passes through miles of scenery which amply rewards that sharpened perception, in the company of dozens of other enthusiastic, capable riders, with backup support in the form of emergency aid, signposting, food and drink, and the like—well, that, basically, is the point of the cyclosportive, and needs no further defence. Thus it was that, as soon as I heard that Iconic Cycling Events (the organisers of the well-received Bike Bath cyclosportive) were putting on another sportive in Oxford, offering marked-out circular rides of 20, 50 and 80 miles north of the city, I signed up instantly for the 80-mile route. I was especially excited that the event was to taken place in September: I have cycled the lanes of north Oxfordshire for nearly thirty years, and would forgive anyone who thought that Keats was inspired to write his magnificent lyrical tribute ‘To Autumn’ (‘Season of mists and mellow fruitfulness,’ etc.) while bicycling round that part of the county during that time of year. More on the subject of beauty in a moment, however. First, the essential practical details. The event is called Bike Oxford, with headquarters at the Iffley Road rugby ground. The organisers expect to establish it as an annual event—the team member who waved me off at the start announced it as ‘the inaugural Bike Oxford’—so I’ll take that as read, and generally use the present tense instead of the past. Registration and check-in. An entry fee is payable when you register (easily done through the Internet); the cost depends on the length of the route (the maximum this year was £32, for 80-milers). Your rider number must be displayed; it is printed on a smart laminated 3-by-4-inch card which attaches easily to the handlebars with the zip-ties provided, and which stays well out of the way. Check-in is possible the day before the ride, and I strongly recommend it if you are an 80-miler, particularly if you want to be amongst the first off (see below, ‘Start protocol’). Safety. Hard-shell helmets are compulsory. Each of the routes is patrolled by a large van and a control number can be phoned in case of trouble (unless the incident is urgent enough for 999; there were no such incidents on the day). Pre-start amenities. Simple food and drink are available at a tea shack. A local bike shop does last-minute maintenance on your machine if you need it. If you wanted a last-minute warm-up, one of the sponsors’ stalls was manned by two amiable physiotherapists and offered an exercise bike for the purpose—and, if you liked, ‘the 250-Metre Sprint Challenge’, an eyeballs-out effort of that distance which registers an impressive amount of information about your time, riding style etc. into a device on the handlebars. I was persuaded to take up the challenge—and, while I was happy to get a good opportunity to wake up my lymphatic system, I was even happier to have done several minutes of gentle warm-up first. Start protocol. Eighty-milers are to set off between 7 and 8 a.m.; 50-milers between 8 and 9; 20-milers between 9 and 10 (relaxed in case of necessity, I gather; I met up at the end with a 50-mile couple from Didcot who couldn’t start till 9.45 because it was a Sunday and there were no earlier trains to Oxford). Riders seem to be sent off at intervals in groups of ten, or at least that was the case at the beginning; I pushed off with the very first group, just past seven. Route finding. Maps of all the routes, including an elevation profile, are posted on the Bike Oxford website about a week in advance; you can zoom these in to spy-satellite resolution if you wish. On or about the same day, GPX and TCX files of all three routes are e-mailed to every registrant. An A4 sheet with a paper map of the relevant route is handed out to the participant at check-in. The map itself could be larger and more detailed (it measured less than 4 inches by 5 inches) although the route is well signposted with arrows before, at and after every significant junction. Refreshments on the road. Feeding stations are provided on every route, where both food and drink (and toilets) are available for no extra charge: one for 20-milers, two for 50 and three for 80. Eighty-milers travel 33 miles to the first station and another 26 miles to the second. Time limit. There is no formal time limit, though eventually back-markers in a ‘broom wagon’ drive round the route to collect the signs and other paraphernalia, and riders who are caught up are offered the choice of a lift or continuing on without signposting. The time allowance is pretty generous: though naturally it depends on when you start, several 80-milers took eight and three-quarters hours and still came in with time to spare; and of the 622 starters, only four failed to finish. So if you can manage the standard Audax-ride minimum of 15 kilometres (9.2 miles) per hour, counting stops, for a distance of at least 100km (62 miles), you should be able to ride fast enough to keep well ahead of the broom wagon. Indeed, a good way to test your capability for the 80-mile Bike Oxford route is to do an Audax event of at least 100km no more than a month before (for Audax information, try <www.aukweb.net> in the first instance). There should be no reason to feel embarrassed about your time, or your clothing or equipment, for that matter: I found Bike Oxford refreshingly free of snobbery. Incidentally, all finishers are officially timed. Each rider fixes an ingenious little ten-centimetre-long strip, no thicker than Sellotape, to the left side of their helmet; that strip enables a sensor in a mat on the start/finish line to record their overall time for the ride. After you finish, you can print out a souvenir slip with your time by entering your rider number into a specially programmed computer in the registration tent. Après-ride. I got back to the Iffley rugby ground rather late so may have missed some things, because the event begins to wind down around three o’clock (I counted about 20 bikes and 35 people still remaining at 3.45; I was the last rider to leave, at 4.30). But I can confidently assert that finishers receive an attractive medal and a goodie bag, as well as a bottle of a sponsor’s beer. In addition to the recovery food in the goodie bag, there were still slices of complementary quiche to be had from a local café—and the sponsoring brewery doled out, by gravity, one free pint or half-pint on demand. The registration tent is spacious enough to seat several dozen round the tables provided; and anyone in the tent, or for that matter the rest of the rugby ground and beyond, was serenaded with live amplified music till about three-thirty. One day later, my time was posted on the Internet and, by then, individual rider photos were on sale, also on the Internet—at least twice I had ridden past a photographer with a wildlife telephoto lens on a tripod who snapped each rider as they came by. Even more pleasurable were the beauties I alluded to earlier. The organisers thoughtfully marked out the first few miles as a loop round the centre of Oxford, a hushed, atmospheric stage-set at seven o’clock on a still, cloudy September morning. In the Cherwell valley just south of the Heyfords, a lone shaft of sunlight pierced the early morning overcast and struck a snow-white building on the other side of the river, throwing it into dazzling relief. Mile after mile, the leaves on the elders in the hedges had gone over to varying pastel shades of yellow, all of them setting off exquisitely the jet-black berries. The midday sunshine, bright but temperate, teased out the luxuriant range of cinnamon tints from the ironstone cottages and churches. And, as weariness was well and truly setting in on the return leg, I witnessed a flock of at least a hundred rooks, and their equally carefree cousins the daws, performing an intricate aerial ballet, seeming, in their insistent raucous cries, to rejoice at the end of the moulting season, when uninhibited flight is possible once again. Finally, no less agreeable was the hospitality: throughout the day, staff and volunteers were polite and cheerful, and willing to offer me every assistance. I confess that, for the last ten miles or so, half of my gear ratios seemed to be reverse; and for most of the last five miles I simply wanted to get the ride over with. But my mood lightened considerably after the finish thanks to the amenities at headquarters. It only remains for me to register a few caveats and concerns. First, while for the most part the standard of bike handling is far higher than one can expect from an ordinary mass-participation ride (anyone who has also ridden the London-to-Brighton will understand this all too well), your cyclist’s sixth sense will still prove indispensable, because more than a few fellow-riders will overtake without notice and cut back in right in front of you. That said, this irritant diminishes over the course of the ride as the field spreads out. As for the feeding stations—with due respect to the organisers—they are mountains of sugar, quite excessive even for an endurance event. We already consume much too much of that, and it’s wreaking havoc on the hormones that control the sensations of hunger and satiety—and therefore body weight, susceptibility to diabetes, cardiovascular disease and cancer, and countless other crucial health factors. (2) Substituting a good deal more savoury complex carbohydrates, protein and (the right sort of) fat (not potato crisps) for the sugar would redress the nutritional balance. A good beginning could be made by offering the quiche during the ride, as well as after. One gratuitous hazard was built into all three routes—we were sent down Oxford’s Merton Street, notorious for its egg-shaped cobblestones across its entire width (excepting the potholes). As a courtesy to riders with lightweight wheels and high-pressure tyres (nearly everyone), that street should be eliminated from future editions. Speaking of potholes—and this of course is outside the organisers’ control—a disturbing proportion of the road surfaces on the Bike Oxford routes are positively necrotic. To take but one example, the brief but sharp descent into Hook Norton has more pockmarks than all the faces in the court of Charles the Second put together. (Scarcely surprising, since Oxfordshire spends less per capita on road maintenance than almost any other local authority in the UK.) I quickly realised that I had to curb my exuberance on the downhill runs, even where the surface was perfectly visible a long way in advance—albeit even then the descent out of Elsfield was so bumpy that it jolted my rear light out of its bracket, the parts ending up scattered all over the road. I would be keen to hear from women riders on what they think about the significance of the gender (im)balance on long cyclosportives. Bike Oxford, I think, is typical—nearly fifty–fifty on the 20-miler; nearly three men to one woman on the 50; and nearly five men to every woman on the 80. Lastly, a point I touched on above—the live music in the registration tent. The venue is simply too small to accommodate both amplified music and comfortable conversation, especially in the tent; the sound follows you everywhere, like it or not, at a volume that can’t be ignored. If the organisers of Bike Oxford can resolve the problems I have identified which are within their control, they will transform a very good cyclosportive into an excellent one. P.S. I can tell that your curiosity is tormenting you, reader, so I shall relieve your distress. My time was 8 hours 1 minute 37 seconds, an average of 10.0 mph (rounded up)—218th out of 224 eighty-mile finishers. 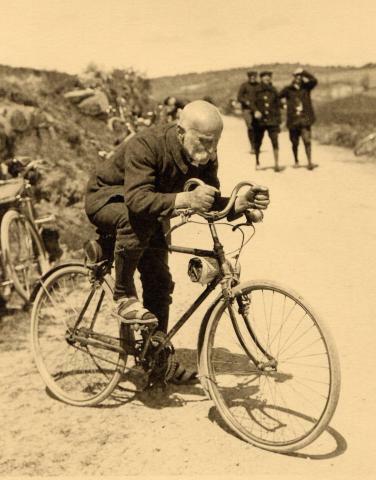 And no, I am not in the least disheartened to have discovered that at the same age (59), Vélocio rode four hundred miles in forty-six hours—on 1912 roads on (at best) a 1912 bike, across much more demanding terrain in the south-east of France. By the bye, following that ride Vélocio vowed thereafter to cycle no more than forty hours at a stretch. (1) Quotation and all other information on Vélocio from Clifford L. Graves, ‘Vélocio, Grand Seigneur’, Bicycling, May 1965; reprinted on several webpages, such as <www.randonneurs.bc.ca/history/cyclo-tourism_velocio_clifford-graves.html>. (2) For a very accessible—and truly sobering—demonstration of these facts, see Dr Robert Lustig, Fat Chance: The Bitter Truth about Sugar (2013). Illustration: Vélocio in 1924, with a bicycle of his own invention. © Collection Musée d’Art et d’Industrie de St-Etienne. TIMOTHY BARTEL is a volunteer mechanic at the Broken Spoke and a member of the Cyclists’ Touring Club, and has been cycling in earnest for forty-five years. In addition to articles in scholarly journals, and a scholarly book, on topics in philosophy, theology and religious studies, he has published in the Tandem Club Journal, Cycling Plus, the Church Times (on the moral roots of doping in sport), the Guardian, and The Times.